Discussion in 'Veterinary News' started by Admin, Jun 17, 2016. Puppy love: Simone took the time out of the busy program to recharge with regular puppy cuddles. 'A connection with animals and land is deeply ingrained in my personality and who I am,' Armstrong explains. 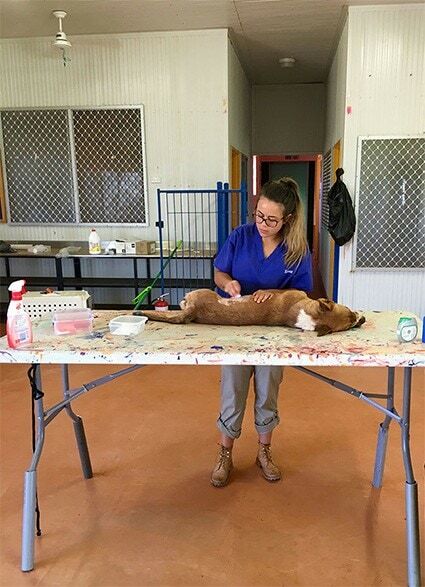 Now in the second year of a Bachelor of Veterinary Biology and Doctor of Veterinary Medicine double degree, Armstrong's passion is set to become her profession - although she's in no hurry to leave the University, just yet. The big discovery of veterinary science and Armstrong's decision to make animals the focus of her career began in year 10. 'During subject selections I was flicking through a booklet and thinking what can I do,' she says. It was her career adviser who urged her to pursue her animal aspirations. 'I still remember exactly where I was sitting when I was talking with my career adviser. Looking back, Armstrong says it was an impulsive but instinctive decision that has helped shape her future ever since. 'I took really strategic steps from there to ensure it was a good decision, and I've not ever regretted it. One of those avenues involved a trip to the Northern Territory in February this year. With the support of her academic adviser and mentor, Associate Professor and Sub Dean of Indigenous Education at the Faculty of Veterinary Science Jaime Gongora, Armstrong participated in an animal management program with the group Animal Management in Rural and Remote Indigenous Communities (AMRRIC). The program stretched across three outback communities: Nyirripi, Yuelamu and Yuendumu. AMRRIC is a not-for-profit charity that coordinates veterinary and education programs in Indigenous communities. The organisation's approach recognises the inextricable links between human, animal and environmental health and wellbeing. The group's team of staff, partners and volunteers made more than 250 visits to communities and numerous outstations over the past year, desexing more than 3,440 dogs, treating 12,150 dogs for parasites, and visiting more than 1,720 homes to consult with pet owners. 'Unlike previous animal management protocols, these programs respectfully treat animals,' Armstrong explains. 'They build trust and strong connections, which is far more efficient in creating a healthier and happier environment for members of the community and the animals themselves. 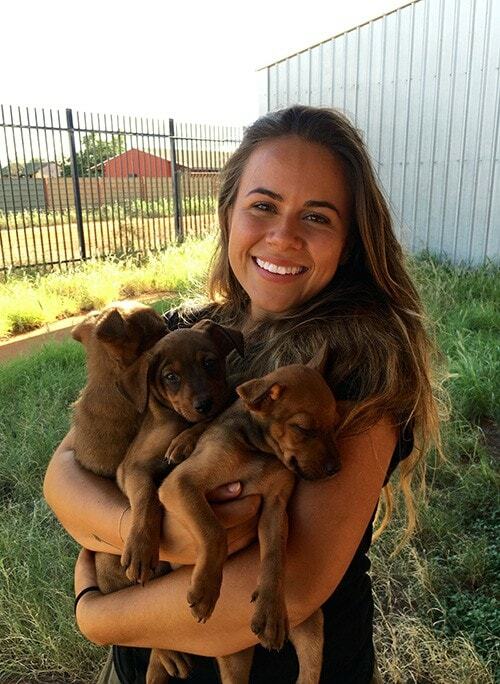 Vet student Simone Armstrong desexes a dog in Northern Territory rural aboriginal community. Doctor in the making: Armstrong helping to make a difference in rural Aboriginal communities. Armstrong says it was both challenging and rewarding. Back on campus, 'intensely competitive' are the words Armstrong uses to describe getting into veterinary sciences at Sydney, a course which is ranked number one in Australia and nine globally in the 2016 QS Subject Rankings. Outside of the classroom Armstrong makes time each week for one shift at Sydney Animal Hospitals. Armstrong says she finds working with fellow student nurses and talented vets immensely rewarding and inspiring. So what's the most surprising thing about uni? 'Maybe the fact that I'm happy to stay here for ages,' Armstrong candidly shares. 'I want to stay at uni forever! Uni provides a platform where I can explore all my interests and passions'. Aside from furry friends, Armstrong's passions include rural Australia and indigenous education - which she has been able to explore at the University through both the AMRRIC program and in her role as a Student Ambassador. The infectious animal lover has set her sights high and aims on studying a PhD after her double degree, doing 'some sort of research'. Eventually Armstrong wants a career in which she can combine her research aspirations with a clinical veterinary doctor position, but for now she's quite comfortable right where she is.